Oct. 30, 2017 - The Wood Pellet Association of Canada, together with media partner, Canadian Biomass magazine, is hosting the NB Wood Pellet Forum at the Crowne Plaza Lord Beaverbrook Hotel in Fredericton New Brunswick on Dec. 12 from 7 a.m. to 10:30 a.m. 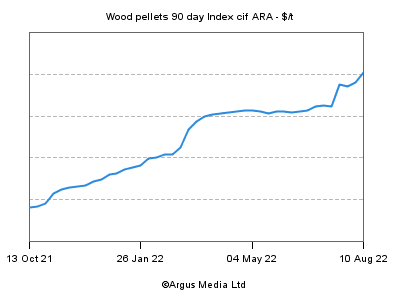 The province’s wood pellet producers have developed a fledgling industry that would be capable of so much more with the support and engagement of provincial and municipal governments and NB Power. At the NB Wood Pellet Forum, we will discuss opportunities to simultaneously grow the New Brunswick wood pellet industry, lower the province's energy costs, and help the New Brunswick government meet the objectives set out in its recently released Climate Change Action Plan. Growing employment and investment in rural communities. Growing an industry based on using waste materials generated by the sawmill industry. A cost-effective, reliable, and climate-beneficial way to reduce pollution and meet the government’s objective to stop using coal in NB. Lowering heating costs and emissions in NB’s homes, businesses, and public institutions. Reducing dependence on foreign imports of oil and coal, keeping money circulating within NB’s economy for local benefit. We urge representatives of New Brunswick’s provincial and municipal governments and NB Power to join us at this important event! See agenda of the event here.